Goats have a severe negative impact on the environment since they graze on native vegetation, preventing regeneration. To examine the effect of goats and other grazing animals on local flora, a study was conducted at Wadi Ghalilah in the emirate of Ra’s al-Khaimah. For the purpose, five abandoned, but fenced, farms and two unfenced farms were studied to determine the number of plant species growing there. 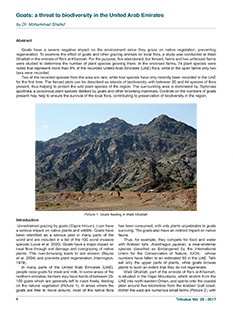 In the enclosed farms, 74 plant species were noted that represent more than 9% of the recorded United Arab Emirates (UAE) flora, while in the open farms only two taxa were recorded. Two of the recorded species from the area are rare, while four species have only recently been recorded in the UAE for the first time. The fenced plots can be described as islands of biodiversity, with between 20 and 44 species of flora present, thus helping to protect the wild plant species of the region. The surrounding area is dominated by Tephrosia apollinea, a poisonous plant species disliked by goats and other browsing mammals. Controls on the numbers of goats present may help to ensure the survival of the local flora, contributing to preservation of biodiversity in the region.